The Chinese market had 44,874 new electric cars in December, far from the 60,000 expected by analysts, but still up 27% year over year (YoY) and far more than the electric car sales in the US and Europe. Overall, China’s plug-in market share rose to a record 1.45%, above the USA (0.8%) and Europe (1.3%). Despite the “disappointing” plateauing in December, which is a bit like what happens when you expect that Usain Bolt will break the 0–100 meter world record every time he goes on the track, looking at the big picture, the 351,861 electric car sales registered in China during 2016 represent approximately 46% of ALL plug-ins sold worldwide this year, with Chinese carmakers responsible for 43% of all EV production in 2016. In December, there were a number of fresh models shining, with the BAIC EC180 being the most impressive, reaching 2nd place right on its landing month. #1 – Geely Emgrand EV: Geely, one of the largest carmakers in China, owner of Volvo and LTI (the iconic black cab from London), joined the EV bandwagon this year by bringing the Emgrand EV to market. The Emgrand EV is an electric conversion of its successful middle-of-the-road sedan. Last month, it was the most successful it or any other electric car has been to date, with a massive 6,023 registrations, a new all-time record for a single model in China. That gave the model its first “best seller” title. With okay looks and good-but-not-outstanding specs (127 hp, 0–100 km/h in 9.9 seconds, 253 kms range from a 45 kWh lithium battery), Geely is betting on making a good first entry into the market and stealing sales from BYD and BAIC sedans while the more export-oriented Lynk & Co plug-ins do not arrive. #3 – Chery Arrizo 7 PHEV: Another newcomer willing to stir the established players, the Arrizo 7 PHEV is Chery’s newest product. Having arrived just in October, it is already reaching the podium thanks to 2,922 registrations last month. Sitting at the heart of the plug-in hybrid sedan market, with a starting price of 150,000 Yuan (€20,500), a 9.3 kWh battery, and 50 kilometers of electric range, this model wants to give the BYD Qin and SAIC’s e550 a run for the money and hopefully repeat this podium position in coming months. #4 – BYD e6: Below all these newcomers we have the longest running plug-in in China. Zooming the streets since 2010, the BYD e6 experienced a record year in 2016. This is thanks in part to some new impressive range specs that shame everyone bar Tesla — 400 kilometers of range coming from an 80 kWh battery. Popular among taxi fleets, this model ended the year with 2,528 registrations in December. 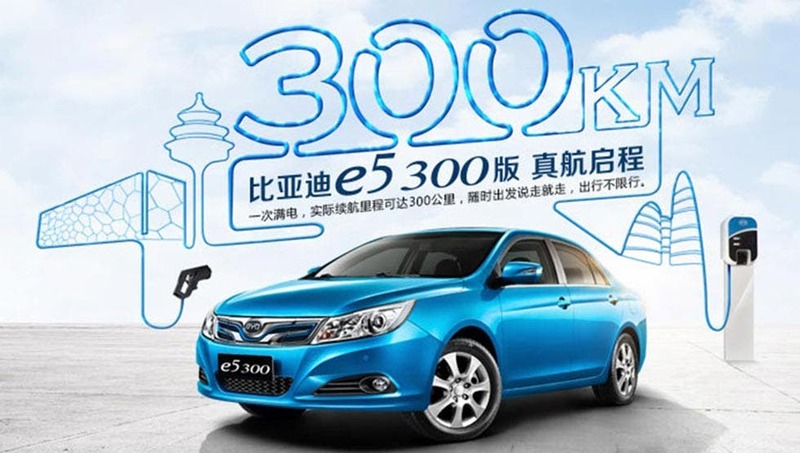 #5 – BYD e5: This regular-looking sedan is on the rise, having beaten its monthly record in December with 2,420 registrations. The e5 is starting to become a regular in this top 5 ranking. Unlike the more show-stopping Qin EV300, the e5 feels more taxi-friendly regular, but with basically the same specs as the all-electric Qin, 305 kilometers of range included, this is a BYD (230,000 Yuan / €30,000) for cost-conscious customers. With over 70(!) models on sale, three of them landing last month, the Chinese electric car market is by far the most dynamic on earth, with plenty of surprises and changes. Proof of this balance is the fact the BYD Tang, China’s best-selling plug-in car in 2016 ended the year with 31,000 units, or just 9% of the plug-in market, the lowest share of any winner in the world. Also, it hasn’t won a monthly best seller trophy since July. … Despite this, it was a record year for the Chinese SUV, scoring 31,405 registrations, slightly below the 31,898 all-time record set by its BYD Qin relative in 2015, but enough to leave the same BYD Qin, in 2nd place this year, some 10,000 units behind. But the real surprise this year was the 3rd place finish of the veteran BYD e6. Thanks to a strong Q4 (7,715 registrations), it climbed to 3rd place for the first time since 2013, with a record 20,605 registrations, making that three BYDs on the podium, a first. Below those three BYD models, we find two BAIC models, the E-Series EV and the EU260. Both of these models had disappointing performances in December and were surpassed by the old fox BYD e6. The Geely Emgrand EV jumped to #6 in December on the back of its amazing sales month, leaving strong credentials for 2017. Will we see it run for the leadership? Looking at the manufacturer ranking, leader BYD lost 3% market share, falling to 28%, but it was enough to win the manufacturer title (third in a row). It achieved this by putting three models on the podium (gold, silver, and bronze), another in #9, and other in #14. Not bad, eh? BAIC (12%) ended in 2nd place and Zotye (11%) secured the 3rd spot, ahead of SAIC, Chery, and Zhidou (each with 6% share). An always popular debate is Tesla’s performance in China, so here is a small tip on its performance: There were only 108 Model S sedans delivered in December because it was the first month with mass deliveries of the Model X, which saw more than 1,000 units being delivered in December. As a result, Tesla ended the year with 3% market share, being the best-selling foreign manufacturer, ahead of Porsche (1%) by far. Finally, looking at the breakdown between BEVs and PHEVs, unlike other markets where plug-in hybrids have the upper hand, all-electric cars just keep on improving share, ending the year at 76%, up 1% regarding November 2016 and 7% more than the result achieved in 2015.